Suka & Spice™: Just For Men. Didn't that commercial used to get on your nerves? I mean Just For Men...we get it. But anyway, this is not IT. I was shopping this week with some good guy friends who were in search of the tools of the trade that would specifically help their tricky skin issues. Polynesian guys, African American guys, yellow guys, purple guys...shoot, a lot of men in general...tend to have an issue that I like to refer to as "noses with large pores". Gross. But it doesn't have to be. What happens, is if you have a tendency to sweat a lot, and scrub down just a little, you're going to end up with a somewhat bumpy, clogged up, and totally frustrating schnoz. What this led to, was one of the guys grabbing a whole array of products--all of which he claims have completely changed his view of men's skincare. This anonymous male had previously been using whatever he could find in his shower to fix what was becoming dry, flaky, and annoying skin. I took him straight to Nordstrom, and we picked up the Anthony Logistics For Men Facial Scrub ($20). This was to be used twice weekly, as a means of sloughing off the dead skin (not just on his nose, but all throughout his face and neck). We then departed for Sephora, where we were going to pick up a tool that is most excellent for guys facing this problem: The Blemish Extractor ($16). I can't sing the praises for this tool loudly enough. After a warm shower, all one needs to do, is press and pull this against every part of the nose (especially in the corners), and you'll be amazed and equally disgusted at what it extracts. If you are a girl who is just very close friends with a man who owns one of these, you too can use it for random breakouts or blemishes. I recommend using it at night, as sometimes it can be easy to press to a little too firmly, and you end up with impression marks (that always disappear by morning). This is when my anonymous pal told me that he was only using soap and water. Really though? I thought that was a myth that guys still do that! 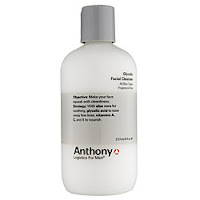 So we then picked out some more Anthony products--their Glycolic Facial Cleanser ($20), and Facial Moisturizer with SPF 15 ($31). I've tried and tested all of these things on the dear other half over the years, so I know they're worth their weight. The best thing is, now that Mr. Anonymous has invested his own hard-earned money into these products, he feels obligated to use them. Which he has. Which he has been grateful for, because his skin is looking stunning. Right on dude! What if I were a light brown guy with an extra-large nose, haha? I think soap and water work pretty well, though, with a decent moisturizer... Ok, I think I'm in too deep to back out, haha, but it seems to work sufficiently, no? Is the nose thing necessary? yes. in fact, i'm almost 90% positive that it's necessary for island boys. you'd be so surprised (and disgusted) at what the thing extracts. and for that reason alone, you wouldn't want to share or borrow anyone else's. haha! we have to take care of our skin now..you will thank me for it as you get older, and people continue to think you're getting younger. love your blogs sis!!! Glad we connected via blogspot! Much 'ofas! @sione: i can only guess you're "that" light brown guy...soap will eventually dry out your face though. there's no time to lose..you're not getting any younger! the nose thing, btw..is absolutely necessary.